Different parts of a steer or lamb taste different, and are cooked differently. Use this guide to learn more about kosher meat and find new cuts to enjoy. 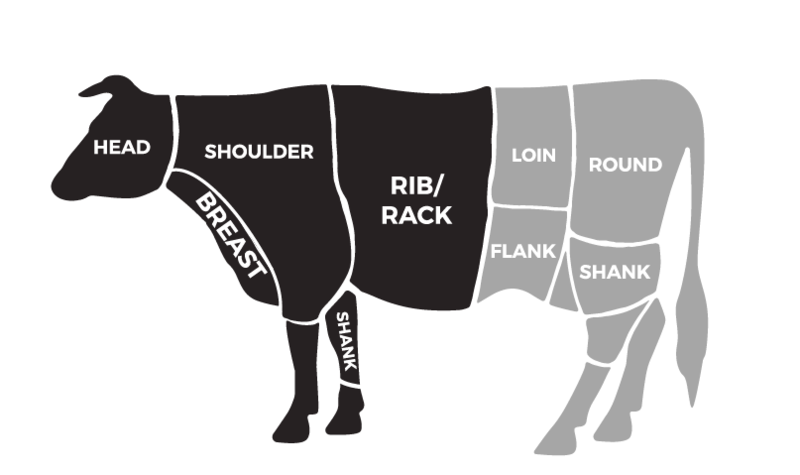 Since only the front half of red meat animals is used for kosher, those cuts are shown in black on the diagram, and explained below. The non-kosher cuts (shown in grey) are for reference only. By far the most popular meat we sell, our pastured Black Angus beef is flavorful, tender and perfectly marbled. The taste, texture and cooking method will vary depending on which cuts you are using. Whatever the occasion, though, this beef will deliver incredible taste and quality that will elevate any meal. The brisket is the well worked pectoral muscles of the steer. The two muscles are held together by a rich deposit of fat. Brisket is a tough cut, with great beefy flavor, and should be slow-cooked. The chuck is the beefiest of the primals, with a mix of medium-tender to and chewier cuts that benefit from longer cooking or braising. The fat content of most chuck cuts is a bit higher than the shoulder cuts, but the flavor is unparalleled. The ribs from the chuck are leaner than plate ribs, but extremely flavorful. The plate, or belly, is a fatty and tough primal, and benefits from long cooking, curing, and smoking. The ribs from the plate are the most richly marbled on the steer, and can be smoked, slow roasted, or braised. These cuts are in general quite rich and succulent. The seven bones of the rib primal include the most expensive and tender cuts on the steer. These cuts are especially prized for their perfect balance of tenderness and flavor. The very tender eye of the rib-eye is our Beef "Tenderloin"
Muscles on the shank, like the brisket, are hardworking and tough, and they are also ribbonned with collagen. A long slow braise of these cuts will produce tender meat, and break the collagen down into gelatin that produces a thick and silky sauce. "Osso Bucco" means "bone with a hole" in Italian. The marrow in this cut is delicious. Or just roast the Marrow Bones on their own to add flavor to soups, stews or to enjoy on its own. The shoulder is one of the leanest primals on the steer. Some sections are more tender, and are cut into London broil-type steaks; the tougher pieces are cut smaller (Pepper Steak, Shoulder Steak) and can be cooked quickly over high heat. Roasts from the shoulder can be braised or roasted, but we recommend cooking to rare either way. Cuts from the head are collagen rich and tough; when slow cooked, they become incredibly tender and flavorful. Don’t overlook these tasty cuts! Rich in iron and flavor, our pastured beef liver can be made into chopped liver or cut into strips and pan fried (after kashering) to add to salads. We do not currently offer other offal cuts such as Beef Heart or Sweet Breads. Our lamb graze in the rich Shenandoah Valley, producing meat that is richly marbled and wonderfully flavorful without being "too lamby." Choose lamb when you want to really enjoy a flavorful meal, perhaps a smaller portion of meat, or explore Middle Eastern or Indian seasonings. Since lamb are much smaller, some of the primals that are separate on a steer are combined here. The lamb breast includes what we call “brisket” and “plate ribs” on a steer. The cuts from this primal are quite fatty, and benefit from long and slow cooking, or curing. The lamb neck is tough, meaty, and relatively lean, making it perfect for braising for stews and soups. The lamb rack is analogous to the beef rib primal. This primal contains the most tender cuts that become either rack of lamb, or lamb chops. While the outside has a fair amount of fat, the eye-meat on the chops is relatively lean. 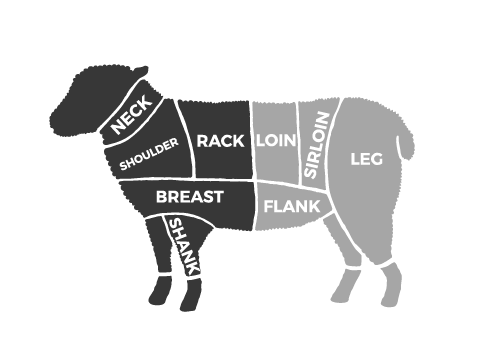 The lamb shoulder contains the most diverse cuts of all the lamb primals. Tender meat from the shoulder can be used for kabobs, and tougher pieces can be made into braising roasts. We also cut shoulder and rainbow chops from this primal. Our delicious Rose Veal is generally quite lean and should be cooked to a tender rare. Brining definitely improves texture and flavor (we've noted which cuts can especially benefit from brining below). What's Rose Veal? Older than conventional veal, our animals are raised on pasture with their mothers, never confined (which is why their meat is pink, not white) and weaned naturally. The flavor is generally lighter than beef, with almost 'floral' notes. In meatballs or meatloaf, using some Ground Rose Veal along with Ground Beef and/or Ground Lamb will lighten the texture and flavor. This is the fattiest primal on of the veal, and contains cuts that are perfect for long and slow braising. The rack provides the most tender and highly prized cuts of veal, but is much much leaner than either beef or lamb. We recommend using a dry or wet brine for Rack of Veal, Veal Rib Chops and Veal Hanger Steak (learn more here). Like beef, veal shanks are lean and tough, but full of collagen that breaks down with a long, slow braise, and becomes incredibly tender. The veal shoulder is lean and contains tender and tougher cuts. The tender cuts can be used for scaloppini, stews, and hot roasting. The tougher cuts benefit from braising. 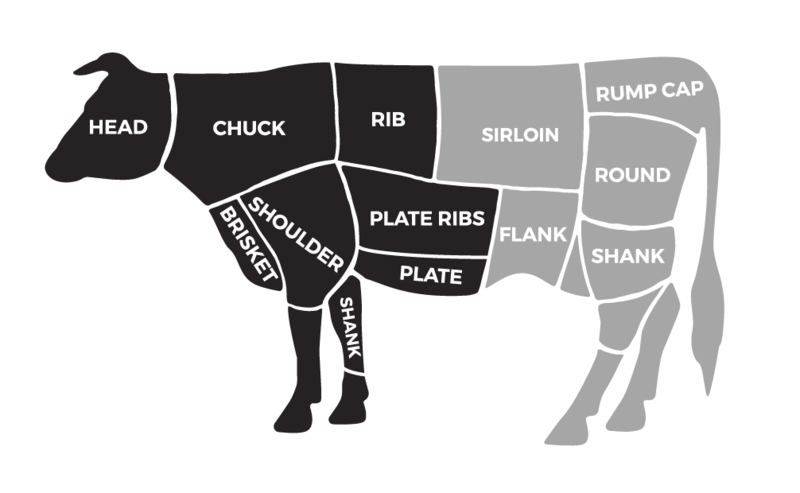 We recommend using a dry or wet brine for Veal Shoulder Chops and Veal Shoulder Roast (learn more here). Veal Neck Roast is a classic for "pot roast"
Cuts from the head are collagen rich and tough; when slow cooked, they become incredibly tender and flavorful. The flavor of veal liver is slightly milder than beef, and this makes it a highly sought after ingredient for chopped liver, liver mousse and more. We do not carry any other rose veal offal cuts.